It would be a lot easier to sit and criticize about how the company is missing deadlines but I think it's worth appreciating the magnitude of what the company is actually trying to do within the industry. The Electric Forest had its share of obituaries over the years but the new American car company Tesla is determined to prove that the concept is a workable one. the Tesla Roadster looks good and can hold its own in the performance arena. Tesla has pre-sold about 900 cars of Tesla Roadster 1.0 (Earlier Version of the Tesla Roadster). In 2017, it was finally time for a refresh, the new updated model of the Tesla Roadster is an absolute beast. The Tesla Roadster can do 0 to 100 km/h or 60 mph in 1.9 seconds and Tesla Roadster can also do 0 to 160 km/h or 100 mph in 4.2 seconds. it’s the first production car in the world to break the two-second barrier. It’s said to also produce 10-kilonewton meters of torque at the wheels. at the recent presentation, Elon Musk didn’t say the top speed but did say that it can go over 250 mph or 400 km/h. The question has to be asked after looking at the above figures, is this actually feasible or is this pie in the sky?. The Mechanical Engineering assistant professor Venkat Viswanathan focuses on next-generation battery technology, he remarked that the 1.9-second figure actually seems reasonable, he added that a 200-kilowatt-hour battery pack can easily go 600 miles. an interesting point of note is he estimates that the battery weight alone will be 833 kilograms or 1,800 pounds, as it turns out it’s actually the grip on the tires and the management of getting the power down from the motors to the actual wheels that will be the main bottlenecks in this vehicle. it looks like Tesla is doing this to make a solid point. this vehicle was meant to be a statement a kind of watershed moment to tell people that this is the direction that are cars going to take, no one can argue with it if it’s faster, quicker and more value for money than most supercars that are out there. but that is if the production model has the same numbers that are listed for the prototype figures. Tesla has actually had a lot of experience with the P100D on that front so it seems reasonable that they could get that done. The thing that stood out to us is that this car is breaking all the records. The Nissen GTR (Nismo version) can go 0 to 60mph in 2.7 seconds costing you $175,000 whereas Lamborghini Aventador SV can go 0 to 60mph in just 2.4 seconds and the cost of this vehicle is $493,000. Bugatti Chiron can go 0 to 60mph in 2.3 seconds and its cost is $2.6M. McLaren P1 GTR can go 0 to 60 in 2.4 seconds costing you 3.6 million dollars. The Dodge Challenger SRT demon coming out next year which can go 0 to 60mph in 2.3 seconds and this car will cost you $84,000 so that’s actually great value for money. next up the Porsche 918 Spyder which can go 0 to 60mph in 2.2 seconds and cost of it is $845k and then, of course, the new Tesla Roadster 0 to 60mph in just 1.9 seconds and the Tesla Roadster will cost you $200k. The Agera RS by Sweden’s Koenigsegg currently holds the world record at 277.9 mph or about 445 km/h. 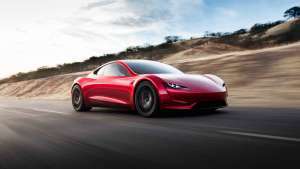 The crowd was still getting over the top speed figures when Elon Musk announced that Tesla Roadster has a 200-kilowatt-hour battery which can provide 620 miles of range or over a thousand kilometers. for comparison, the P100D has about 420 miles of range. The range will be key to converting or at least convincing those critical of electric cars that this is no longer a gimmick. also for all of this, it’s important to note that this is the base model, the slowest option of this new Tesla Roadster. so the question must be asked, are there any cars that can actually do 0 to 60 in under two seconds right now? the answer is yes but they’re all F1 cars dragsters or rally cars, but surprisingly the acceleration of f1 cars average from about 2.1 seconds 2.7 seconds. For fun, NASA’s Saturn V rocket can do 0 to 60 in 1.5 seconds but if you run the ultimate a top fuel dragster can do that in 0.8 seconds. It accelerates so quickly that the car is already traveling at 60 miles an hour by the time the rear tires have crossed the start line. you’ve got to keep in mind that these drag cars can’t even turn properly and need a parachute to even slow down. this isn’t to mention that they can only see one person and consume over half a standard tank of fuel per run. so all in all 1.9 seconds by Tesla in a production car isn’t bad at all and if the company can get this into production by 2020 as planned, the world has no choice but to realize that they’re looking at the future. Some analysts were saying that this new Tesla Roadster may have been a way to shift investor attention away from the Tesla Model 3 production issues and reignite some excitement in the company. We are not so sure if the sole purpose of the Roadster was to shift attention away from the Tesla Model 3 but you can certainly see the announcement being rushed forward to partly achieve that. It would be a lot easier to sit and criticize about how the company is missing deadlines but it’s worth appreciating the magnitude of what the company is actually trying to do within the order industry. it’s not easy for such a small and brand-new company so hopefully, the production issues get sorted out and the rest flows smoothly from there. As most of you know, the Tesla Model 3 was supposed to be the electric car that was for the masses. when it was launched back in July the company was anticipating a production rate of 20,000 cars per month by the end of December. it’s no secret that the fate of Tesla largely hangs on the success of the Tesla Model 3. so it’s important that they get this right .with vehicles like the electric semi truck and the new roadster in the pipeline really do want Tesla to succeed so that these vehicles come to fruition. so anyway what do you guys think? what’s your views on the Tesla truck and the new roadster? let me know your thoughts in the comments section.